For Apple fans, watching favorite videos on iPhone iPad will be an extremely cool thing. By default, iPhone and iPad are able to support TV Out. So it is much amazing to display and share iPhone iPad video on our widescreen home TV with family members by connecting a TV Out cable to iDevice. But if we would love to play videos with Apple incompatible formats, such as, MKV, FLV, M2TS, WMV, etc., we may need a video converter to convert them to Apple-approved videos (MP4, MOV, M4V), then sync to iDevice with iTunes. However, we are always frustrated by the long time conversion process. What's worse, it will take up large memory, even affect the performance of iDevice if we store lot of videos on iPhone iPad. Now with a free iPhone iPad app, Air Playit, we will be never worried about the tedious conversion and space taking. It supports streaming almost all videos to home TV via iPhone iPad. So, we can watch videos or movies in any formats on TV with perfect video & audio effects. How Does Air Platyit Work to Stream Videos to Home TV? Air Playit is a free iPhone iPad video streaming application which can instantly stream any videos from PC or Mac to iPhone iPad via WiFi, 3G, 4G networks. After streaming videos to iDevice, we can remotely watch these videos stored on computer, iPhone, iPad without taking storage. 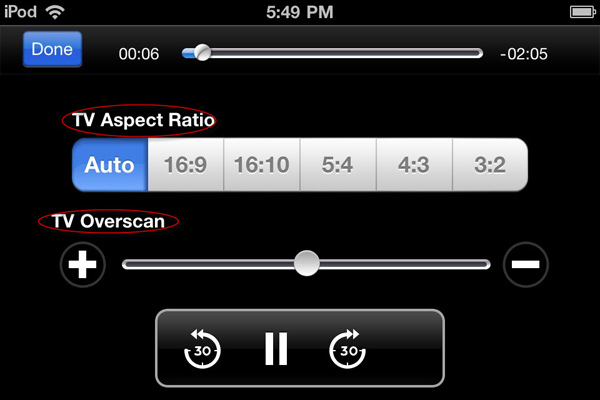 When meeting incompatible video formats, this free iPhone iPad app will live converting and streaming video to Apple-approved formats. Because of TV Out support, Air Playit can help streaming video to TV via iPhone iPad. 1. 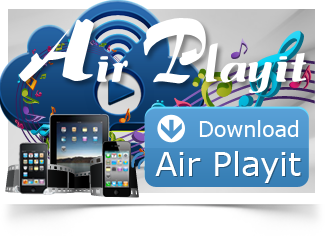 Download and install Air Playit Server on Mac or PC. 2. Download and install App Client on iPhone or iPad. 3. Connect your iPhone iPad with TV via TV Out cable, such as Apple Composite AV Cable. Here I take iPhone and Mac for example. Step One: Run the server, click "Add Folder" to add video audio to "Sharing Folders". 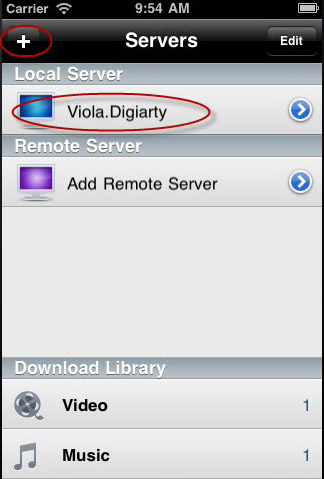 Step Two: Launch app client on your iPhone and add server. Client app can automatically discover the local server by Bonjour Server. If sometimes the client app can't find the Bonjour connection information, you need to specify the server address manually or close the firewall for a try. Step Three: Browse the folders under the server, choose the video you want to watch, and click "Play" on the iPhone. Streaming video to TV is on the go. You can watch video on big screen without waiting. 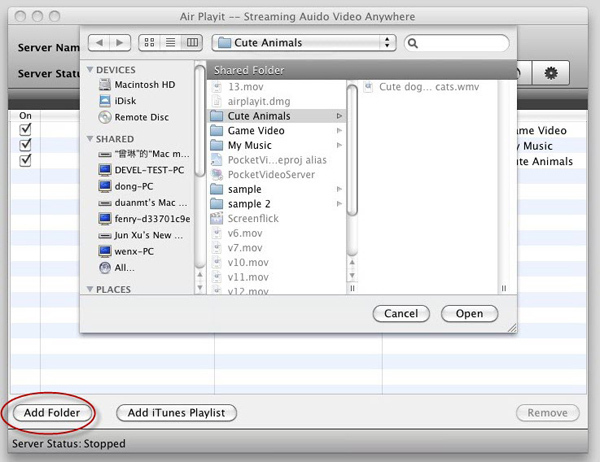 Air Playit can stream videos in almost any format to iPhone, iPad and iPod touch. If the videos are not in format supported by iPhone or iPad, it will convert them on the fly. Want to be able to remotely access it and watch the videos when you are not at home or just get ready of taking off in the airport? Here is the step-by-step guide of adding remote server to get remote access working.